Second-novelist Schulman (Out of Time, 1991) offers a tragicomedy about a doctor whose marital problems trigger a radical reevaluation of his entire life. David Hershleder is a 39-year-old neurologist and son of a Holocaust survivor who’s going through a midlife crisis. His marriage is disintegrating. He finds it increasingly difficult to focus on his patients. He prefers to immerse himself in library research. He has the nagging feeling that he’s picking up all the habits he found off-putting about his father. 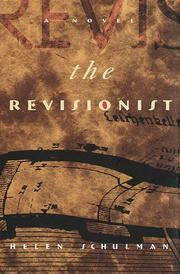 In a strange and circuitous attempt to revive his marriage and rediscover himself, he becomes interested in tracking down and speaking to a onetime Holocaust denier who has recently published a massive tome (translated by an old schoolfriend of Hershleder’s) in which he reverses himself and declares the historical truth of the extermination of the Six Million. Accompanied by another old friend (who, like the translator, is also named David), Hershleder goes to Los Angeles and then to Paris to confront the apostate racist with the hope of discovering how it’s possible to turn one’s life completely around. On this slender and somewhat improbable thread, Schulman builds an intelligent, intermittently funny, but ultimately unsatisfying story whose major plot twists are too easily predictable. Although handled with seeming decency and taste, the Holocaust theme, juxtaposed with Hershleder’s more mundane problems, seems forced and almost exploitative. The novel veers between a Jewish take on the Cheever-Updike world of dysfunctional suburbia (including a trick chapter ending that echoes “The Swimmer”) and a vaguely Philip Rothian concern with the more unpleasant manifestations of the weakness of the flesh. Unfortunately, Schulman lacks the wry understatement of Cheever, the sheer word-drunkenness of Updike, and the overpowering brio of Roth. A minor addition to the fiction memorializing Jewish suburban-American angst.